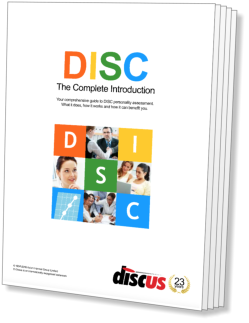 The first of the four DISC factors is Dominance, or simply 'D'. Throughout this guide, we have used red to represent this factor and its associated type on the Style Card, the 'Driver'. This is appropriate because, as its name suggests, Dominance is the factor of directness, assertiveness and control. If you have read the History section, you may be interested to know that the Greeks would have associated Dominance with blood and fire, a fitting combination for this tempestuous factor. 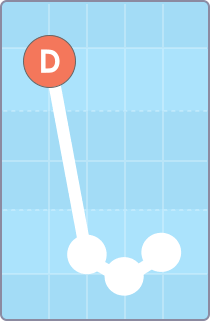 Dominance is the left-most factor shown on a DISC graph, as you can see from the example to the left. Like all the factors, D is a blend of positive and negative traits. On the positive side, highly Dominant individuals are independently-minded, motivated to succeed, and generally very effective at getting their own way. As we have seen above, however, they can also be hot-tempered and even aggressive under certain conditions. Dominance can be summarised as the factor of control. People with this factor prominent in their DISC profiles focus on the need to achieve and maintain a measure of authority and power over other people and, more generally, the environment in which they live and work. Competitiveness and ambition are also associated with the D factor, and people showing this element will struggle to achieve their aims in life against great odds. Indeed, they seem to enjoy challenge, and rarely back away from a difficult or risky situation. Dominant individuals are not naturally trusting of others - they will seek to attain success on their own merits, without asking for or expecting help or support from those around them. Should a situation arise where the assistance of others is an unavoidable necessity, they will tend to issue orders directly, rather than asking for co-operation.